Celebrate the bountiful berry harvest right here in the city! On Sunday, July 22nd, join us at Mt. Pleasant Farmers Market as we celebrate all things berrylicious at our annual Berry Festival! Look out for berry displays and tasting activities for kids and adults alike, discover berry recipes, storage tips & tricks, and enter your best berry pie in our annual BC Berry Pie Bake-Off for a chance to win prizes and glory! PLUS – Learn to make a frutti rossi jam with our friends at Italian Cultural Centre! As part of our 2018 Berry Festival, Benedetta Diamante, graduate of the University of Gastronomic Sciences-Slow Food Italy, will present an evening canning workshop from 6:30-9pm on July 23 & 31. Learn how to preserve the berry goodness with this intimate, hands-on class that teaches you the boiling water bath canning technique, the most useful canning tools, how to choose the best ingredients, and the safest canning practices. More info and to register at the event page. Vancouver’s best berry pie baker will be crowned! Do you know someone who makes the best berry pie this side of the Fraser? 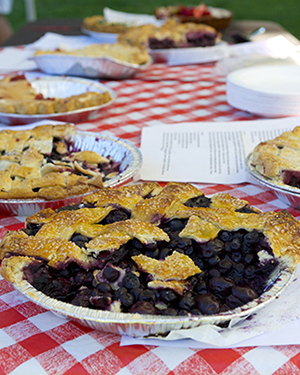 We’re looking to crown Vancouver’s next home berry pie baker at Berry Festival on July 22nd! We’ll be sampling all pies by donation, so stick around after the judging and have a taste of the best pies in town! Click here to enter your pie. All proceeds raised from the Berry Pie Bake-Off will go to support our Fresh to Families project! Taste blueberries, strawberries, raspberries & blackberries from different farmers, learn about berries and storage tips – have fun! We’ll also have special edition free recipes, and plenty of berries for sale! Are you a market member? Our berry vendors will be featuring member-exclusive berry specials, so make sure to bring your membership card or purchase a membership at the Info Tent to take advantage of the perks!